This is incredibly embarrasing to admit, but until a few months ago, I didn’t know that wine “legs” were a physical phenomenon. When the issue came up and I realized how completely in the dark I was, I did what I usually do and researched the heck out of it. Sometimes I hear tasting room guests musing about legs to themselves and their friends, and while they’re way ahead of where I was — at least they know what legs are — they are caught up in some of the myths that surround this curiosity. The simple truth lies in physics. Legs form because of the alcohol content of the wine and the effects of surface tension, adhesion and evaporation. 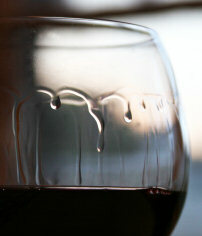 Because alcohol has a lower surface tension, it tends to crawl up the glass. And it evaporates faster than the water in the wine because of its lower boiling point. As more alcohol evaporates, the water concentration increases. The greater surface tension of the water causes the wine to pull together into a teardrop that then runs down the inside of the glass. This is called the Marangoni effect. A persistent myth is that long legs indicate a sweeter or better quality wine. In truth, it just indicates a higher level of alcohol. Because a wine’s “body” is affected by the alcohol content, there is some relationship between legs and body, but there are so many other factors involved that legs are a poor indicator of quality. In fact, if you cover the top of the glass with your hand, legs will stop forming because you have eliminated the alcohol evaporation.